You’ve heard of microservices, but what’s a micro frontend? You’ll learn this and how to get started with a micro frontend for web developers in this post. Wondering what "micro frontends" means? Check the micro frontends description here. Simply speaking, a micro frontend must implement business logic from top to bottom (database, middleware, and UI) in an isolated environment, it should be reusable and pluggable into the main application’s UI shell. There must be no shared variables between micro frontends. The advantage is that distributed teams can work on separate micro frontends; this improves large and modular system development. There is a runtime advantage, too: if one of the frontends stops working, the main application should continue to work. 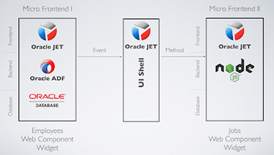 I have implemented micro frontend architecture with Oracle JET. The source code is available in this GitHub repository. There are three applications, two with micro frontends, and one being the master UI shell. Both micro frontends are implemented as JET Composite Components. The first is hosted on WebLogic; it calls the ADF BC REST service in the backend. The second is hosted on Node.JS and returns static data. The first micro frontend implements a listener, which allows handling of actions from the outside. Read the complete article here.